Thinking Big is a selection of forty-five examples of extraordinary twentieth- and twenty-first-century design from among the 645 such objects collected by the Brooklyn Museum since the year 2000. 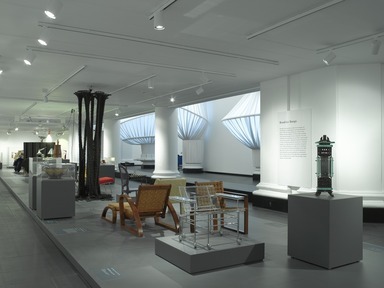 Although most of the objects in the installation are indeed large, the title also reflects the belief that in order to keep the Museum’s legendary collection of decorative arts on the cutting edge it is essential to think big in a metaphorical sense as well—to foresee what it is that will define the design of an era and pursue it. 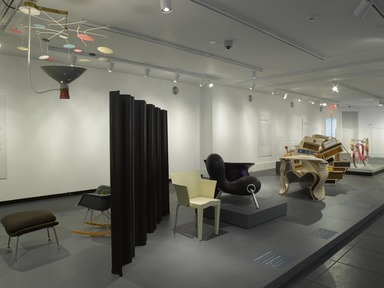 Oftentimes the objects that come into the collection are considered important for their incorporation of exciting new materials, such as plastics, fiberglass, and plywood in the twentieth century. At other times they are appreciated for their innovative use of new technologies, such as computers and lasers. Of course, new materials and technologies only reach their potential when great designers know what to do with them. A number of the works on view here were designed by winners of awards for lifetime achievement or for innovative work by young designers that are presented annually by the Museum in conjunction with the international antiques show Modernism. 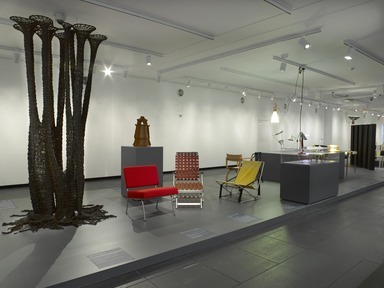 Important exhibitions have also helped the Museum define its collecting direction, particularly its commitment to building a world-renowned collection of design from the 1920s and 1930s and to pursuing design of the mid-twentieth century, one of the strengths of this installation. Since the beginning, in 1902, the purpose of the collection has been to teach and inform—both about what makes an object a great design and about what that object means in society. This forward-looking idea has been the basis of one of the country’s great design collections. Today, in order to continue to present the best and most exciting works to the public, the Brooklyn Museum is committed to expanding its collection of design with the same foresight and vigor. 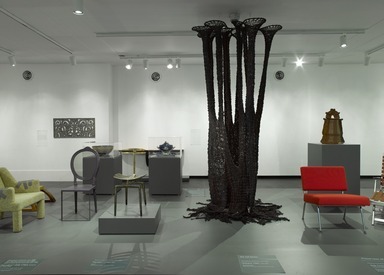 Thinking Big: Recent Design Acquisitions is organized by Barry R. Harwood, Curator of Decorative Arts, Brooklyn Museum. This installation includes a number of designs made between 1940 and 1960. 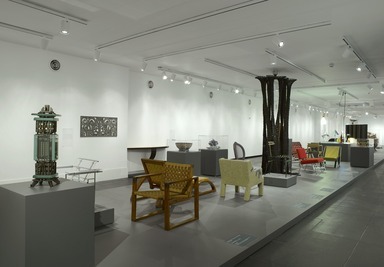 Some of the first examples of mid-twentieth-century design to enter the collection were more than two hundred objects given to the Museum by the Italian government in 1954 that had earlier been shown at the Museum in 1950 in a vast exhibition of Italian postwar design called Italy at Work. It was, however, the 2001 exhibition Vital Forms: American Art and Design in the Atomic Age, 1940–1960 that focused interest on this period and led to the acquisition of a number of the works seen here. Vital Forms explored American design of the mid-twentieth century from the point of view of the importance of the organic, living form as a rejection of the hard-edged machine forms of the previous era. Since then, there has been a continued conscious effort to expand the Museum’s holdings to represent the best and most revealing work from this dynamic era in which American designers often took the lead. 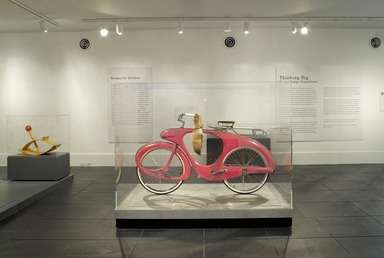 Brooklyn has long been a center for the design and manufacture of useful objects, and historical objects made in Brooklyn have always been a focus of the Museum’s design collection. In colonial days craftsmen made household goods for local consumers, and in the nineteenth century Brooklyn was one of the country’s great manufacturing centers. Although the days of Brooklyn as a center of industrial production may be over, in the past decade or two there has been a tremendous resurgence in the vitality of Brooklyn as a center for art and design. A new generation of artisans and designers have made Brooklyn the center of their work, and the Museum is documenting this growing production by collecting the best of what is produced in Brooklyn today, represented in this installation by the works of Terence Main, Uhuru Design, and Jason Miller. Design affects our perception of all manufactured things, whether they are made for adults or children. In the 1940s, a small number of American toy manufacturers began to design abstract “educational” toys as a conscious alternative to traditional toys. The developmental theory behind these products was that toys that presented familiar objects in an abstract manner would stimulate the imagination of children more than highly detailed, realistic ones and that this would become a source of societal renewal. Creative Playthings, Inc., manufacturer of the Rocking Beauty hobbyhorse seen here, along with companies like Playskool, sought to appeal to the newly prosperous upper-middle-class parents who experienced a dramatic rise in birthrate after World War II and were willing to pay more for limited-production educational toys (as opposed to traditional, mass-produced ones made of plastic). This preference for wood toys painted in primary colors was laden with positive associations from the turn of the century Arts and Crafts Movement, which had been characterized by handcraftsmanship and honest use of beautiful materials, and inspired the same consumers to purchase modernistic Scandinavian furniture. 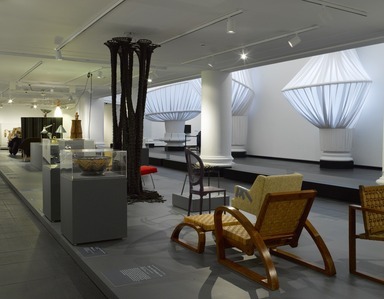 March 4, 2011 To inaugurate new first-floor gallery space, the Brooklyn Museum will present the special exhibition Thinking Big: Recent Design Acquisitions from March 4 through May 29, 2011. The installation of forty-five twentieth- and twenty-first-century objects from the Museum’s permanent collection of decorative arts that have been acquired since 2000 will include a number of large-scale objects that will be exhibited for the first time. Several important themes that have guided these acquisitions will be highlighted, including Brooklyn-designed objects; young designers; unusual materials and innovative methods of production; designs for children; and mid-twentieth century modernism. The Brooklyn Museum has been actively acquiring twentieth- and twenty-first-century objects since the 1970s. Among the works featured in the exhibition are Cinderella Table, by Jeroen Verhoeven, 2005; Chest of Drawers, Model #45, “You Can’t Lay Down Your Memories,” by Tejo Remy, for Droog, 1991; “Nirvana” Armchair, by Wendell Castle, 2007; Spacelander Bicycle, by Benjamin Bowden, 1946; and Womb Chair, by Eero Saarinen, 1947–48. Objects by Charles Eames, Cindy Sherman, Konstantin Grcic, Francis Jourdain, and Harry Allen will also be included. Thinking Big will be the first exhibition in a gallery that has been reclaimed from nonpublic space. The gallery is part of a renovation that is the first phase in a program that will redesign and transform much of the Museum’s first floor beyond the Rubin Pavilion and Lobby, which opened in 2004. The exhibition is organized by Barry R. Harwood, Curator of Decorative Arts, Brooklyn Museum.